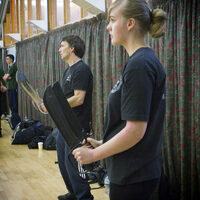 Class time is not wasted on aerobics or fitness training, 100% of class time is spent on Wing Chun. Students can take private lessons but its not a requirement in order to learn the complete system, all aspects of the system are taught fully in open class. Somerset Wing Chun maintains an open, friendly, politics free view of all styles and lineages of wing chun. We avoid politics by teaching the system from a standpoint of applied body mechanics as opposed to individual interpretation. Wing Chun is a concepts and principles art with many differing approaches, interpretations, viewpoints and variations. Even where a number of Sifu's are grouped together within the same lineage, association, academy or family name, there may still be considerable differences in the standard of the resulting students. In setting up Somerset Wing Chun the intention was to teach from the point of view of the student, Somerset Wing Chun students are taught to question and not take what is being presented at face value. Somerset Wing Chun tries to keep as true as possible to the original Ip Man Wing Chun in our core syllabus, whilst researching the many variations and emphasis which have come to prominence over the last 50 years, so that students can critically analyse what is being presented and maximise their understanding. We come from an excellent Chinese lineage and are grateful and respectful to Grand Master Samuel Kwok and the Ip Man Wing Chun Kung Fu family. We believe that it is this source of our knowledge and the quality of our club level instructors which is important and gives you the most benefit.